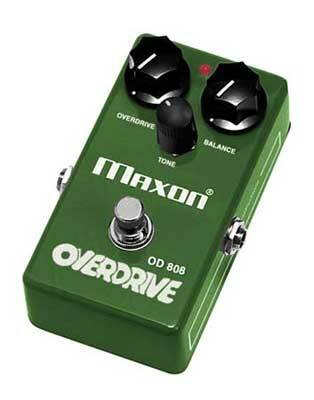 The quintessential overdrive pedal - often imitated but never matched. Identical to the original circuit and featuring the JRC4558 IC chip, the OD808 reissue offers smooth, natural overdrive similar to a full-up tube amplifier. Incredibly transparent, the OD808 responds to individual playing dynamics and lets the true tone of your instrument shine through. PAST - PRESENT - PERFECT No matter how fast technology advances, some things just cannot be improved upon. The mark of true genius is the company that recognizes this fact and works to preserve tradition, rather than re-invent it. Introducing Maxon Reissue Effects. Faithful reproductions of their legendary 1970's product line, the Maxon Reissue Effects offer today's musician an unparalleled sonic palette that has defined the tones of legendary Guitarists for the past three decades. True to the original designs, each model's circuit is 100% analog and hand-assembled by masters of the craft with over 30 years experience in the field of effect design and construction. Packaged in a time-tested chassis, only the highest quality components are used to assure a lifetime of trouble-free performance. Forget about boutique clones that promise but don't deliver. Maxon did it first, they did it best, and they're doing it again. Maxon Reissue Effects: The perfect sounds of the past, available in the present. Get yours today. History Since their humble beginnings as a guitar pickup manufacturer in 1966, Nisshin Onpa Co., Ltd. (Maxon) has strove to supply musicians with the ultimate tools of the trade. Highly respected for their manufacturing prowess, Nisshin Onpa has designed and manufactured some of the most famous music products of our time, including many of the most sought-after guitar effects units and wireless systems from today's top suppliers. In addition, Nisshin's own brand of Maxon products has achieved a legendary status among Tone Freaks and Gearheads across the globe due to their superior quality and unsurpassed tone. Over 30 years since their inception, Nisshin Onpa is once again offering Maxon products to the discerning musician. Their line of Reissue Series compact Guitar effects and the all-new line of Vintage Series effects are the absolute ultimate tone machines and offer uncompromised sound and superior manufacturing quality for those of us who will accept nothing less than the best.